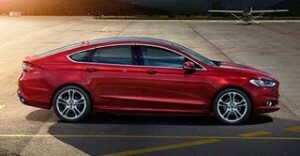 The new Ford Mondeo is a five door hatchback and estate car, this fifth generation model has been on sale in the US since 2013 but due to the relocation of production for Europe from Belgium to Spain, the outgoing model had an extended lifespan of almost eight years. Styling wise the new Mondeo has the wide flat front grille that is evident across all new Ford models, and this Mondeo is considerably more streamlined than the outgoing model giving a 10% reduction in drag but this does mean that the headroom for rear passengers is compromised. The Mondeo retains its cavernous interior and comfortable seating position that will see you eating up the motorway miles in comfort. The front dash is considerably cleaner and is dominated by an 8″ touchscreen that controls the audio, the syncing from your mobile device and Sat Nav (titanium model). Competition comes in the form of the excellent Mazda 6 which we believe to be a better drive, the super new Vauxhall Insignia and the ‘Premium’ Volkswagen Passat. Three models are available on the Scheme, the Zetec, the sporty ST Line edition and the range topping Titanium, the Titanium X is now a £2000 option on the Titanium grade and not an actual model. The Zetec is well appointed with 17 inch alloy wheels, front fog lamps & LED daytime running lights, LED tail lights, power folding door mirrors with puddle light, front and rear parking sensors, DAB Audio with Navigation System, SYNC 3 with 8″ colour touchscreen, emergency assistance, Active City Stop, dual zone electronic auto temperature, cruise control with adjustable speed limiter and the excellent heated front windscreen. The Titanium adds 18 inch alloy wheels, start button and keyless entry, automatic automatic lights and wipers, traffic sign recognition, lane keeping aid, premium leather seats, 10-way driver & passenger power seats (drivers seat with memory) and variable heated front seats. The St Line Edition has 19 inch alloy wheels, sport suspension, full body styling kit, rear privacy glass, aluminium foot pedal covers and partial leather seats – black with red stitching. 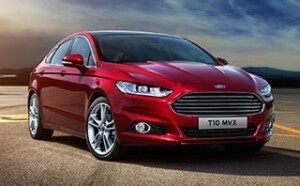 The list of extras that can be added to your Mondeo is lengthy but do bear in mind that any extras you add will be at full price and will be handed back with the car at the end of your lease so choose carefully. Extras include power tailgate – £400, privacy glass £200, heated seats and steering wheel – £300, rear view parking camera £250 and park assist £450, all of these items could just as easily have been included in the Titanium trim but perhaps it helps keep the price down. One item that should be included and not a £175 extra are the rear inflatable seatbelts with a small airbag along the length of the belt that inflates on impact to lessen the impact. 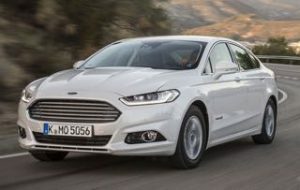 The Mondeo is a big car, there is room for five, and in the standard hatchback a 550-litre boot, which expands to 1,446 litres with the seats down. 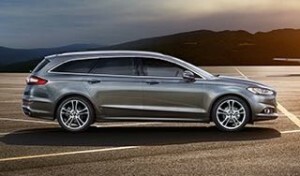 The estate has slightly less seats-up room, with 525 litres, but has the larger seats-down capacity with 1,630 litres and has the advantage of a lower loading bay, that and the fact it looks great. Power for the Mondeo comes in the form of two petrol and three diesel options, the 1.5 litre petrol offering 160bhp and an acceptable 48.7 miles per gallon with a 0-62 time of 9.2 seconds is a super all rounder for those who cover lower milage, it can be paired to a six speed manual or a six speed automatic gearbox. Three diesels are available, the 1.5 Econetic diesel (not avaialble this quarter) with 120bhp that can return 78.5 miles per gallon and turn 0-62 miles per hour in 11.9 seconds while producing only 94g CO2, the larger two litre diesel’s are with either 150 or 180bhp which we feel makes is the better choice for a blend of power and economy, we would favour the 150 as the 180 does not feel much more powerful unless you need the all wheel drive system avaialble on the 180 automatic. The 120 Econetic diesel produces only 107g of CO2 and can return a claimed 68.9 miles per gallon while still reach 62mph in 9.3 seconds. The two litre diesel can be matched with a 6 speed manual or a six speed twin clutch automatic that cuts the economy to 58.9 mpg, which is still excellent. Diesel Automatics start at an eye watering £2895 AP. This Quarter the excellent Estate car is cheaper than the HAtchback.